Built in the 1980's by ACF, the Coalveyor Bathtub Gondola can be found running in unit trains throughout the country. 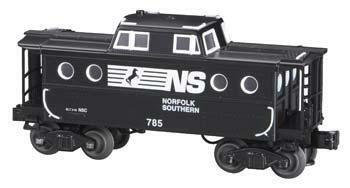 Compatible with any N scale track and equipment. Prototypically correct. Black 100-ton roller-bearing trucks with realistically molded sideframes. Free-rolling brown plastic wheels. Truck mounted AccuMate couplers. 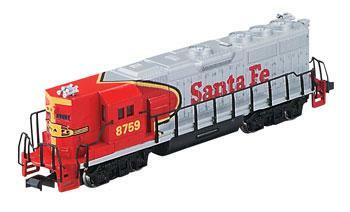 Narrow diesel locomotive is silver and red, #8759, with Santa Fe painted in red on the sides. Compatible with all N scale equipment. Sides contain walking aisles with protective black grab railing. Engraved side paneling reveals door-like structures. Roof top has non-functioning silver horn whistles on each end, and four circular fan vents. Blackened, machined-metal wheels with RP25 contours. Meticulously detailed die cast boiler. Die cast metal chassis and front pilot. Metal grab rail wraps around the boiler. Slope tender with exquisite detail. Frame mounted couplers. Authentically detailed and prototypically painted black with no printing or decoration. Equipped with DCC On Board. Lighted 2-6-2 locomotive is packed with smoke liquid to create smoke from the steam funnel as the train runs. 2 oz bottled smoke liquid is easy to use and replenish. Black locomotive with the #1836 on the cabin sides. Windows of locomotive cabin are separated into small rectangles. Black tender car is filled with coal and reads Union Pacific on the sides. Fully assembled, weighted and ready to run. Powerful motor. E-Z Mate. Modeled after steam locos in service during the 1890s. It was known as the ''American'' because it was one of the most common and best recognized locos in America. It went on to become popular in England, as well. This version has brass trim and an ''oil'' headlight. ON (1/48) Scale but compatible with HO-gauge track DCC-and sound-ready Die-cast metal construction painted black, with red cab windows & a small amount of brass trim Metal valve gear Precision 5-pole, skew-wound motor Working ''oil'' headlight RP25 blackened metal wheels E-Z Mate(R) Mark II couplers on front and rear Fine scale modeling includes rivet, panel and woodgrain detailing and separate molded/cast detail parts that include wood and coal tender loads, oil tank, tool box, rubber pipe for water tender & more Detailed cab interior w/controls, gauges and sliding side windows Tender includes three interchangeable fuel sources: molded wood stack, plastic oil tank and die-cast coal load Includes a package of ''coal dust'' for added detailing and realism DCC(TM) On Board Sound CD Protected by Bachmann's limited lifetime warranty. 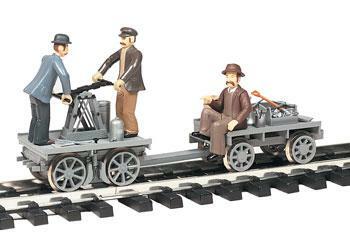 Compatible with any O scale, narrow gauge railroad equipment. Equipped with a lighted interior. Cable runner pole on roof swivels and is spring loaded. Plastic body painted a cream color with red and gold trim details. Arched windows along the sides. Metal wheels with detailed side frames. Authentic pink frosted windows within the raised mid-roof section. Highly detailed Durable ABS plastic shell Die-cast trucks Metal wheels Operating couplers Includes six wooden barrels Prototypical graphics. Highly detailed N5C Porthole Caboose ''Norfolk Southern'' Operates on all ''O'' Gauge tracks Fast angle wheels All metal trucks Die-cast side frames and operating couplers Authentic paint scheme. ''Gandy Dancer'' is a slang term for a member of a track laying or mainten- ance crew. The original sense referred to a worker who tamped down the ballast between the ties using a special tool (a gandy). This involved vigorous stamp- ing on the tool while turning in a circle, an action which might be taken to resemble dancing. Compatible with any G scale model railroad equipment. 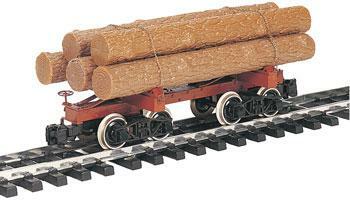 This is a brown undecorated skeleton log car. Authentic molding resembles actual wood. The car carries a load of five plastic logs. Metal log chains are included to assemble onto the car. Realistically molded stirrup steps, brake wheel, grab irons and stakes. 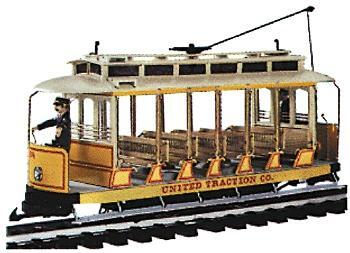 Fully assembled, authentic ''G'' scale model--compatible with all popular brands. Detailed freight trucks with metal wheels. Removable coal load. Molded grab rails, stirrup steps, brakewheel and shaft. Detailed bays. Rivets and brace details. Accurately molded plastic body shell with yellow & green painting and printing: Peabody Short Line, The Coal Route, PSL 6687, Do Not Run Car With Doors Open, data. © Hobbylinc.com. All rights reserved. Images and Descriptions are representative only, actual items may vary. Prices subject to change without notice. Hobbylinc maintains no responsibility for inadvertent errors. hobbylinc.com is a full line hobby shop which carries model train locomotives, freight car, passenger car, hand car, and much more.